Minutes from downtown Pasco and easy access to I-182, travelers appreciate how our comfort, convenience and excellent service are a top priority. 5 miles from Pasco/ TriCities Airport (PSC), we offer complimentary shuttle service. Located at exit 9, I-182, Rd. 68, West Pasco, next to the Trade Recreation Agriculture Center (TRAC) and the Pasco Soccer and Softball Complex. We have an excellent location and we are a 100% smoke-free hotel, as well as pet (dog) friendly. This TriCites hotel will help you maintain your exercise regimen in our fitness center, complete with 2 life-cycles, 3 treadmills and 3 elliptical. Swim year round in our indoor pool or relax in our hot tub. Our 24-hour business center allows you to catch up on work or stay in touch with family and friends online. 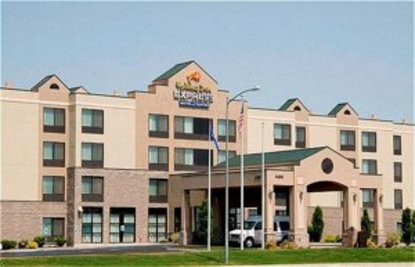 Our 8000 square feet of event space and outstanding catering services makes the Holiday Inn Express Hotel & Suites Pasco/ TriCites "The Place To Meet." We assist with event details, making us the favorite for wedding, conference, reunion and convention planners. Businesses near the hotel: TRAC, Lowe&regs, WalMart Superstore, Douglas Fruit, Cousins Restaurant, and Applebee&regs Restaurant.Attractions near hotel:12-plex Cinema, Pasco Soccer and Softball Complex, and the Columbia Point Golf Course & Park. This hotel is committed to providing accessible facilities under the American Disabilities Act. If your accessibility needs are not met, please contact the Hotel Manager on Duty. Should you require additional information regarding accessible facilities for guests with disabilities, please call 1-800-Holiday (U.S. and Canada) or contact the hotel directly. For the hearing impaired, TDD service is available at 1-800-238-5544 within the U.S. and Canada.